RADIO303 broadcasts live once a month on the 4th Sunday, from 3-5pm uk time on NSB Radio. It’s all about bringing you fresh new music from across the genres, with the odd classic for good measure! Tune in to the next live show and listen again to the latest and featured shows here. 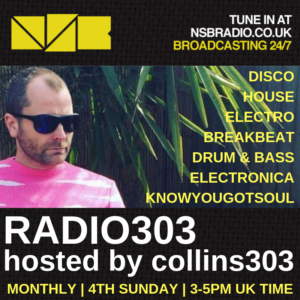 RADIO303 returns live on NSB Radio on Sunday 28/04/19, 3-5pm UK time!